The 6th generation BMW M5 is the quickest and most technologically advanced M-vehicle till date with the ability to go from standstill to 100 kmph in just 3.4seconds. BMW launched the sixth generation of M5 at the Auto Expo 2018 and has priced it at ₹ 1.43 crore (ex-showroom) . The new BMW M5 will come to India as a Completely Built-Up (CBU) model and will be available across the company's dealerships. The 6th generation BMW M5 is the quickest and most technologically advanced M-vehicle till date with the ability to go from standstill to 100 kmph in just 3.4 seconds. This also marks the debut of the first ever BMW M xDrive system with 2WD capability, which allows the driver to easily change between RWD and 4WD when required. First launched in 1984, the BMW M5 is regarded as the quintessential high-performance sports sedan due to its purebred racing genes. When the engine is first started, the all-new BMW M5 will be in all-wheel-drive mode (4WD) with Dynamic Stability Control (DSC) turned on. 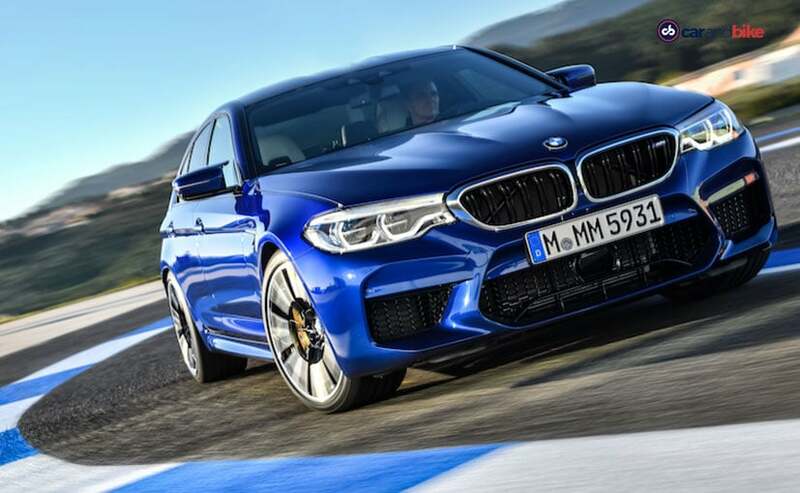 The driver is then able to vary the handling characteristics of the M5 by enabling various driving dynamics modes, including a rear-wheel-drive mode with no DSC. In this 2WD mode, the all-new BMW M5 offers drivers the opportunity to experience BMW's traditional rear-wheel drive characteristics. Like all the models to come out of BMW M GmbH, its design is M-specific. The newly designed front bumper trim, with its larger air intakes provides the cooling systems and brakes with the adequate supply of cooling air. The car has a wider track than its predecessor, and the front side panels (made from aluminum to reduce weight) bear the signature M gills. The redesigned rear diffuser, side skirts, the M rear apron and M rear spoiler, play their part in giving the all-new BMW M5 its powerful sporting appearance, and the exterior mirrors have a dynamic, M-specific design. At the heart of the all-new BMW M5 is the latest and most advanced version of the 4.4-litre V8 engine featuring M TwinPower Turbo technology with an output of 591 bhp and 750 Nm of peak torque. The twin-turbo V8 unit propels the M5 via the new 8-Speed M Steptronic transmission with Drivelogic. With five driving modes to choose from, drivers can configure M xDrive at any time. Even in the default setting with both DSC and 4WD activated, the 2018 M5 allows a certain amount of slip at the rear wheels when accelerating out of corners. In this mode, more drive torque is directed to the rear axle, while the amount of permissible rear wheel slip is increased. While doing so, the onset of oversteer is noticeable and the linear increase of the sideslip angle means that the vehicle remains stable. Mr. Vikram Pawah, President, BMW Group India said, "For over three decades, the BMW M5 has been considered as the most sporting and dynamic executive sedan in the world. It is known as a car that does not hide its raw performance potential, yet at the same time retains its essential motor racing heritage and exudes a more elegant sporty appearance. The BMW M5 has always been the quintessential high-class automobile: fully competent for everyday use as a business sedan, while also fulfilling the role of a high-performance super sports car when desired."